The shield above is courtesy Doug Kerr, and was in Troy, possibly along 6th Ave., but gone now. 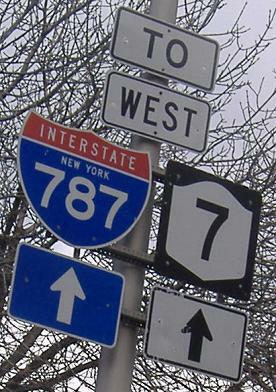 According to DOT reference markers and common sense, I-787 ends north of NY 7, turning into NY 787 before finally ending at NY 32, though the FHWA considers the Collar City Bridge (NY 7) to also be I-787. Well, this shield still is on 6th Ave. in Troy (northbound). It supports the 787/7 multiplex conspiracy. The beginning of the highway, starting facing south from US 9W and then curving around to the northeast. I-87 was proposed to extend down the Northway, past US 20, then parallel the Thruway for several miles - like I-790 and I-90 in Utica but having SB I-87 next to the NB Thruway. Then, down here at Exit 23, I-87 SB would have flowed seamlessly into I-787 NB, with a different-looking interchange complex to the Thruway at Exit 1 and a different arrangement of ramps to and from US 9W. Looking southwest from the end of the sharp 90-degree bend that turns the stub end into a full-fledged freeway. 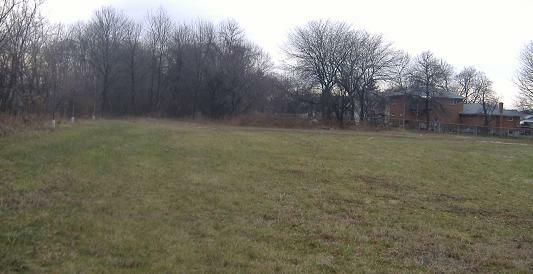 As you can see, there's a square block of land cleared where the freeway would have continued straight (at freeway speeds, imagine!). Since it made no sense, especially from the Thruway Authority's perspective, to have a free road right next to the toll road, the idea of connecting 787 to 87 through this patch of land was permanently canned, and instead now there's a proposal for an E-ZPass only direct connection from the end of the Northway to the Thruway. 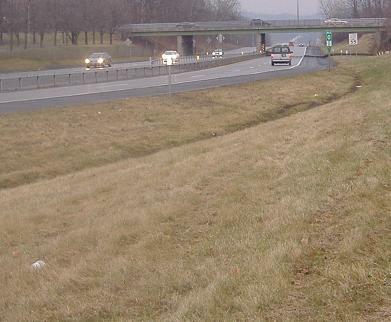 Had I-87 been built as planned, this photo would be from the shoulder line of the freeway, instead of well into the grass across a drainage ditch. 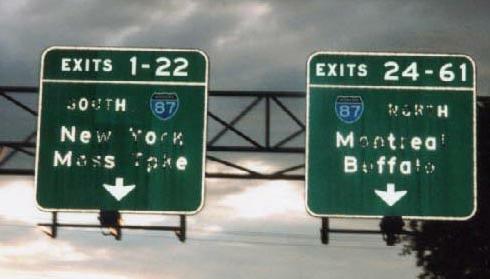 Exit 1 for the Thruway, past the tollbooth, courtesy Doug Kerr. 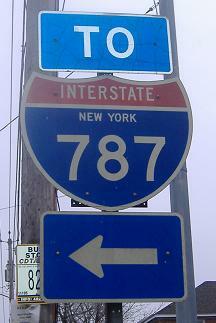 Even before traffic from US 9W starts to curve into the stub alignment, this reference marker pretends it's NY 787. I guess that the Interstate officially ends where the median barrier does, and that NY 787 comes back to cover the rest of the connection to 9W. 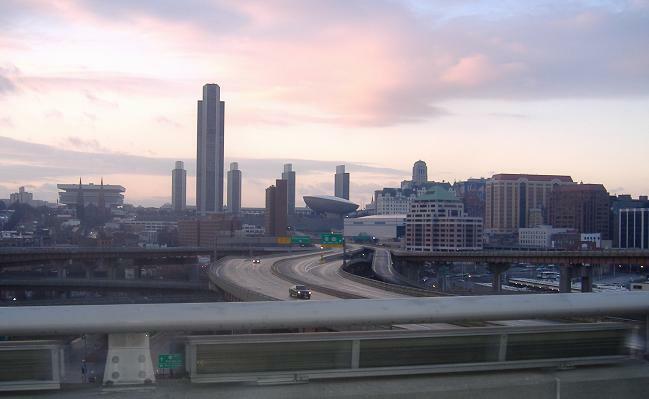 Button copy and sunset-hued Albany scenery from the top of northbound Exit 3. This interchange is the only circle-stack in the world; all left-turn ramps first pass the crossing highway before turning left to cross their originating highway. This in itself is not unique, but the ramps were designed to look perfectly circular from the air, even though at eye level it just looks like a maze of bridges. To achieve this effect, ramps are slightly horizontally offset so as to appear to nest within each other. Here is Nathan Perry's page with a satellite photo showing the effect. Madison Ave. EB, the extension of US 20, entering the freeway at Exit 3. Michael Summa walked onto the freeway in 1973 before it opened and caught this NYSDOT special by the Exit 3 circlestack. 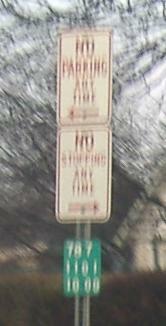 The missing corners are either to save money on sign material or reduce wind loading on the sign. New York doesn't have a monopoly on these, but it's the only state in which I've seen more than one. A second Michael Summa photo, most likely also from 1973, Water St. SB at Broadway. It sure doesn't look like there's any traffic on the highway yet. 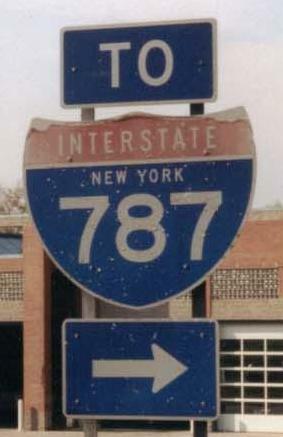 Note the curly 9 on the shield in the middle, one of the last to be installed before New York switched to the modern Highway Gothic font. 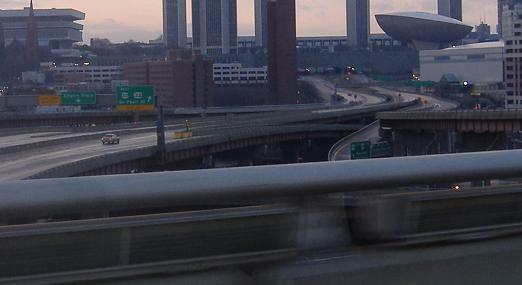 NJDOT takes over Exit 4 into downtown Albany. Ending the way I began. This shield is on Broadway SB at 23rd St. in Watervliet.